Address: 2100, Gödöllő Szabadság tér 5. In the 1760s it was earl Antal Grassalkovich who had the baroque building built as a rest-house in which now the museum works. The four permanent exhibitions present the image how the aboriginal Reformed farmers living near the castle, the Catholic workers settled in the 18th century, the Israelite merchants arriving in the middle of the 19th century, and the artists who settled here in the time of the Dualism shaped, enriched the picture of the town. The Local History Exhibition reviews the history of the township from the Palaeolithic to 1950. Due to storms and stresses, Gödöllő always was a town welcoming everything and everybody new. In its most valuable divisions a natural park was established in 1990. Our exhibition represents three areas of the Gödöllő Nature Protection Region. 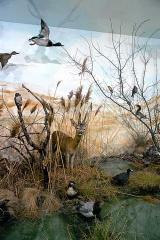 Most part of the diorama demonstrates the flora and fauna of the oak woods. In the neighbourhood of the oakyl woodlands there are the marshy woods and the sedgy lakes. Scouting began in Hungary in 1910 following the example of the scout movement of Robert Baden-Powell. The Hungarian Scouting Association was founded in 1912. Scouting in Hungary flourished between WWI and WWII. Scouting proved to be an excellent method of religious-ethics education, as well as developing international relations after the Treaty of Trianon. Illustrious personae like Pál Teleki and Sándor Sík supported scouting.